James D. "Mike" McKevitt, 71, a partner in the Washington government affairs firm of McKevitt & Schneier who was a former congressman and U.S. assistant attorney general, died September 28, 2000 at Sibley Memorial Hospital after a heart attack. He lived in McLean, Virginia. Mr. McKevitt served in the House as a Colorado Republican for one term before losing a reelection bid in 1972. During his years in the House, he served on the Judiciary, Interior and Small Business committees. In 1973, he served as assistant attorney general for legislative affairs, then in 1973 and 1974 was counsel to the White House Energy Policy Office. From 1974 to 1986, he was federal legislation director of the National Federation of Independent Business. He then practiced law before founding the McKevitt & Schneier government affairs firm in 1989. Mr. McKevitt was a founding member of the Korean War Veterans Memorial Board. In 1987, the former representative of Colorado's 1st District was honored by Sen. William Armstrong (R-Colo.) as a moving force in the enactment of legislation creating the memorial. Over the years, he also had served on the board of the USO, the U.S. Capitol Historical Society and the International Consortium for Research on the Health Effects of Radiation. He was a past president of the University Club of Washington, parliamentarian of the 1986 White House Conference on Small Business and a member of the Bowen Commission on Medicare. His hobbies included sailing the Chesapeake Bay. Mr. McKevitt, who was born in Spokane, Washington, was a 1951 graduate of the University of Idaho and a 1956 graduate of the University of Denver law school. During the Korean War, he served as an Air Force combat intelligence officer in Korea. He was admitted to the Colorado Bar in 1956 and practiced law in Boulder before serving as an assistant attorney general of Colorado from 1958 to 1967. He then served as district attorney for the city and county of Denver until entering Congress in 1971. Mr. McKevitt was a member of St. John's Episcopal Church at Lafayette Square in Washington. 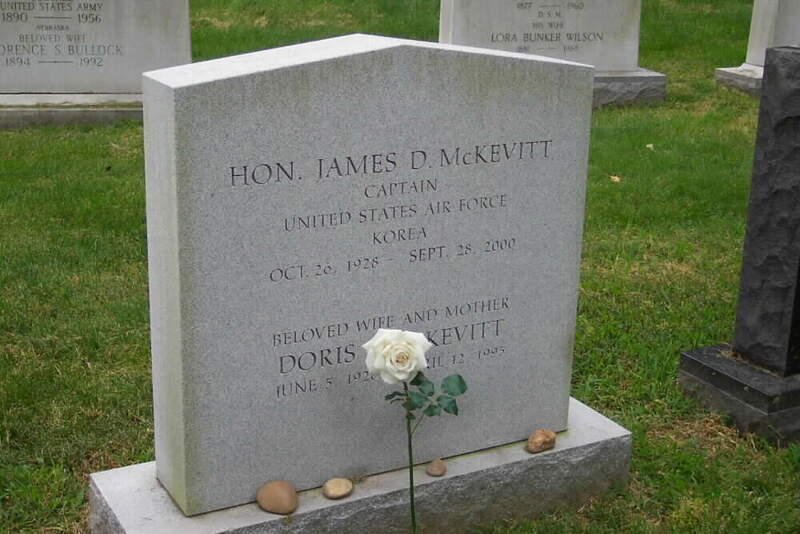 His first wife, Doris L. McKevitt, died in 1994. Survivors include his wife, Judith Woolley McKevitt of McLean; two daughters from his first marriage, Kate McLagan of Austin and Julia Graf of Park City, Utah; and four grandchildren. Suddenly on September 28, 2000, Mike passed away at Sibley Memorial Hospital of a heart attack. A resident of McLean, VA and Annapolis, MD. He is survived by his beloved wife of five years, Judith Woolley McKevitt. He is preceded in death by his first wife Doris L. McKevitt. Also leaving to mourn are his children Kate McLagan of Austin, Texas and Julia Graf of Park City, Utah. Grandfather of Maggie and Ryan McLagan and Anna Melia and Patrick Graf. Friends may call at The Murphy Funeral Home of Arlington, 4510 Wilson Blvd, Arlington, Va. on Tuesday, October 3, from 2 to 4 and 7 to 9 pm. Funeral services will be held at The Ft. Myer Old Post Chapel on Wednesday at 12 noon. Interment with full military honors Arlington National Cemetery. Contributions may be made in his memory to The American Heart Association, 7203 Poplar St., Annandale, VA 22003. Office of Legislation, 1973; counsel, Energy Policy Office, The White House, 1973-74; director of federal legislation, National Federation of Independent Business, 1974-1986; partner in law firm of Webster, Chamberlain, Bean and McKevitt, 1986 to present; is a resident of Alexandria, Virginia. Doris Ellen Lester McKevitt, the wife of former Rep James D. McKevitt, R-Colorado, died Wednesday, April 12, 1995, in Alexandria, Virginia, after a 4-year battle with cancer. She was 66. Mrs McKevitt, a former model, was born in St. Clair, Michigan, where she attended school. She married McKevitt in Mount Clemens, Michigan, on May 25, 1952. McKevitt, a former Denver district attorney, was elected to US House of Representatives from 1st Congressional District in 1970. He ran for re-election in 1972, but was defeated by Rep Pat Schroeder, D-Colorado. The McKevitts moved to the Washington, D.C. area in 1970. Mrs McKevitt was a member of the Congressional Wives Club, a docent of the Smithsonian Institution and a member of the citizens advisory council for Northern VA Community College. She is survived by her husband; daughters Kathryn McLagan of Austin, Texas, and Julia Graf of Park City, Utah; sisters Mary Morris of Clarkston, Michigan, and Kathryn Eppler and Sally Povia, both of Ft Myers, Florida. ; a brother, the Rev. William Lester of Ft Myers, and three grandchildren. Funeral svces are to be Friday at the Ft Myer Post Chapel. Burial will be at Arlington National Cemetery.